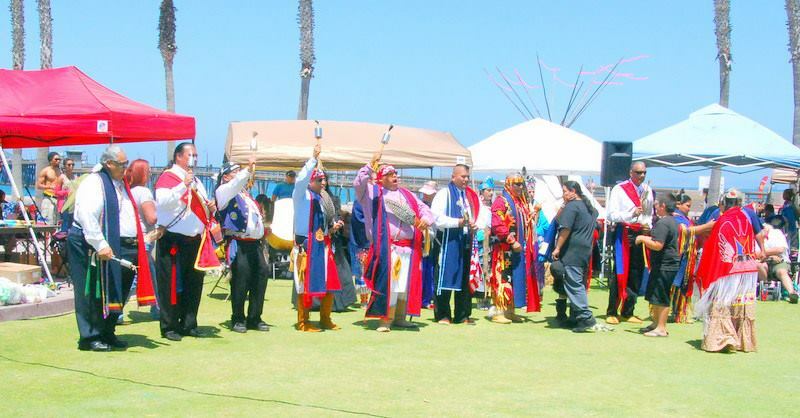 This well attended, Fathers day weekend, annual Imperial Beach Pow wow by the Sea is organized by the Bridge and the Pow wow community board. 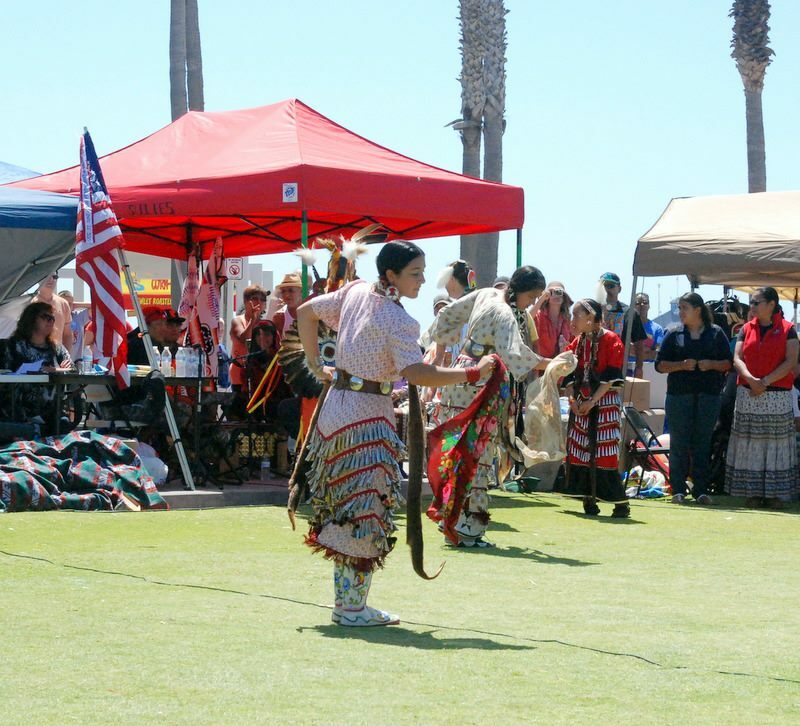 They, along with all the volunteers that supported the June 15-16, 2013 Pow wow by the Sea event, deserved all the appreciation the Pow wow attendees were able to show at this two-day summer solstice and celebration of life. 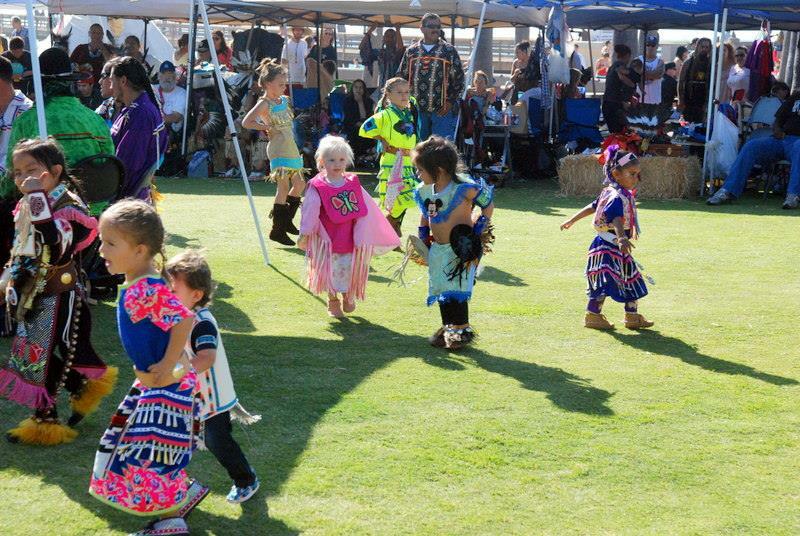 It is so beautiful and empowering to see our Tribal future in the dance circle of life- the children. The Soaring Eagles youth dance workshop, under the direction of Vickie Gambala, were in strong support and beautifully radiant in their regalia and enthusiasm. Most of the members of the Head staff are affiliated with the Soaring Eagles: EmCee, Randy Edmonds, Arena Director, Robert Gastelum, Head Gourd dancer, William Buchanan, Head Man dancer, Larry Gastelum, Head Woman, Chamise Dempsey, Teen Boy, Charles Myron, Teen Girl, Vanessa Franco , Tiny Boy, Tomas Quetzal DeCrane, Tiny Girl, Makenna Jackson . 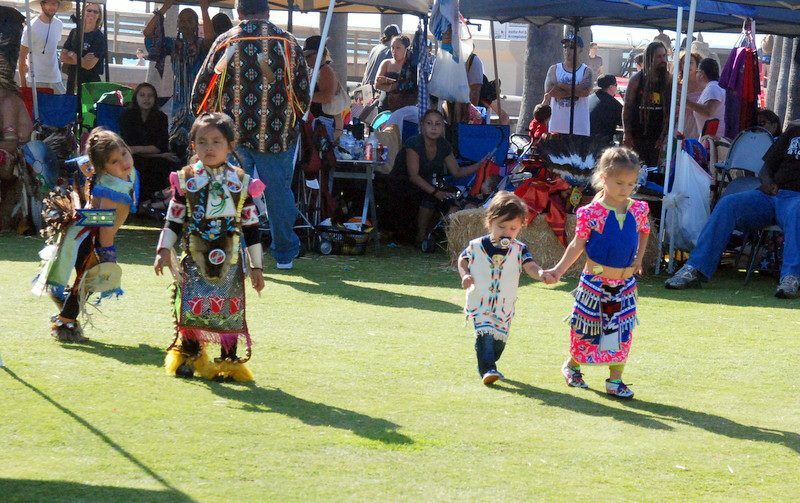 This annual Imperial Beach Pow wow by the Sea is wonderful. Opening Gourd dance was led by AIWA President William Buchanan. He was pleased to accept the honor again. The American Indian Warrior Association Honor Color Guard brought in the colors at the Grand Entry. At the pow wow there were special sponsored dance exhibitions and competitions: Winner take all Iron dance that had men participate but not finish. But then, that is mostly true in Tribal America, Women are powerful. They hold up half the World and bring forth life. We love Indian women! Many visitors enjoyed the special opportunities to choose take home a memory or gift from the many vendors. And many took a chance to win one of the prizes donated by the very happy vendors at the raffle. There were many tasty treats to sample and enjoy from the food booths. There were hundreds of songs sung and thousands of feet dance in joy on our Mother Earth these long days of summer. Now is the time to rejoice. This is the time to dance. You take part to bring balance and harmony when you dance to help heal the earth. All is complete when you choose to show love for all of Gods Creation. Thank you all for your support and attendance at this grand and glorious Fathers day weekend event.